Alaira Tyus signed to play basketball and continue her academic career at Simpson College in Iowa on Tuesday, March 27. Congratulations to Alaira and her entire family! 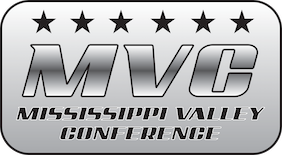 Winter 2017-2018 All Mississippi Valley Conference Teams have been released and several Eagles have been honored, including multiple First Team All-MVC selections. Congratulations to Caden and his entire family on his decision to play basketball next year at Fontbonne University in Missouri! Congratulations and good luck, Caden! Congratulations to Hannah Schmidt for being named to the IHSA All-State Academic Team - Honorable Mention! This is an exclusive group of student-athletes from around the state of Illinois. Hannah was one of 400 nominations for this honor. She is likely the first ever Civic Memorial student athlete to be named to this prestigious All-State Academic Team. Hannah Schmidt plays volleyball and basketball for the Eagles and has a 4.449 GPA and is ranked second in her graduating class. She is pictured here with her parents, Greg and Heather, at girls basketball senior night. Geoff Withers Signs to Play Baseball at McKendree! On Monday, November 13, Geoff Withers signed to play baseball and continue his academic career at McKendree University. Geoff is a senior at CM who plays basketball and baseball. Next fall, he will attend McKendree University where he will play baseball. At the signing ceremony, Geoff was joined by his family, his basketball team and coaches, and his HS baseball team and coaches. Congratulations to Geoff and his entire family! To the right, are photos from the signing event. Thank you to Mr. Micah McKinney and his Construction Trades class for building benches for our Aux Gym locker rooms! The work is outstanding and it was a great "real world" project! Susan Buchanan signed with Westminster College on Tuesday, November 7th, 2017. Susan will play college softball for the Blue Jays next year. Congratulations to Susan and her parents for this accomplishment. Susan was joined at her signing by her parents, her high school softball coach, Luke Angelo, and her Black Widows softball coaches. To the right is a gallery of photos from the signing event. Congratulations, Susan, Eagle Nation is proud of you! Congratulations to our All Mississippi Valley Conference athletes for Fall 2017. Thank you to Tom Lane, Bethalto-area State Farm agent, for the extremely generous donation of our new media backdrop! Pictured to the right is Tom Lane and CM Athletic Director Adam Miller standing in front of the backdrop. This media backdrop will be featured when CM athletes have college signings, banquets and awards nights, photos for students and athletes of the month an many other CM events. Thank you to Tom Lane for your continued support of Eagle Athletics and Civic Memorial High School! Thank you to our Civic Memorial alumni football players, the alumni players from East Alton-Wood River, and to Mike Roper who organized the alumni football game! Mr. Roper and Jamey Westbrook (the CM Alumni Captain) presented Civic Memorial Head Football Coach Mike Parmentier with a check over $7000 for the CM football program. Sales of tickets from the Alumni game were split between CM and East Alton-Wood River's football programs. Family and Individual Athletic Passes are now available for sale in the Main Office. A family pass is $100 and is good for admission to all home events, all year long with the exception of any IHSA events at CM. An individual pass is $30 and is also good for entry to any home game, with the exception of any IHSA events. Please call 377-7220 and ask to speak with Lisa about purchasing a Family or Individual Pass. Haylee Eubanks is a 2004 CMHS graduate who will be inducted into the SIUE Athletic Hall of Fame on October 14, 2017 as one of the 2007 SIUE Softball team that won the NCAA Division II Softball Championship. For anyone interested in attending, they can contact Haylee to RSVP.. Tickets are $40 each. More information on Haley's team and the entire SIUE Class of 2017 can be found at the SIUE website. Eagle Nation is proud of you, Haley -- congratulations! For text message updates on CM Athletics for game cancelations, postponements, and more, just text the message @cmsports to the number 81010. CM Eagles' Athletics Is Now on Twitter and Instagram! Civic Memorial Eagles' Athletics is now on Twitter! Follow us @CM_Eagles for constant updates on Civic Memorial Athletics. Twitter will be used to update the status of games due to weather, post scores, highlight the achievements of our student-athletes and more! If you are already a user of Twitter, please follow us @CM_Eagles. If you do not want to sign up for Twitter, you can still get Twitter updates from Civic Memorial Athletics by visiting http://www.twitter.com/CM_Eagles.